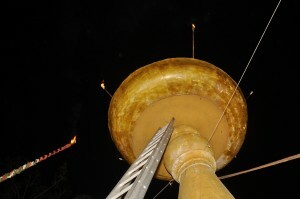 Thiru B. Babu (multiple record holder) and Thiru S. Varadharajan, Chennai, Tamil nadu, had created the world’s tallest Kuthuvilakku (lamp), on 14th April, 2012. The Kuthuvilakku was lighted to mark the launch of the world’s first state oriented records books “The Tamil nadu book of Records”. The Kuthuvilakku had a height of 30 feet and is the tallest ever in the world. Comments for TALLEST KUTHUVILAKKU are now closed.